Pinstripes mixes bowling, Bocce courts, a bar and bistro food with lounging areas popular with both small and large groups. It's second D.C. location opens Aug. 5. WASHINGTON — Pinstripes will open its second Washington-area location at Bethesda’s Pike & Rose development Aug. 5. The company’s first D.C. location opened in Georgetown in 2014. Pinstripes mixes bowling, Bocce courts, a bar and bistro food with lounging areas popular with both small and large groups. 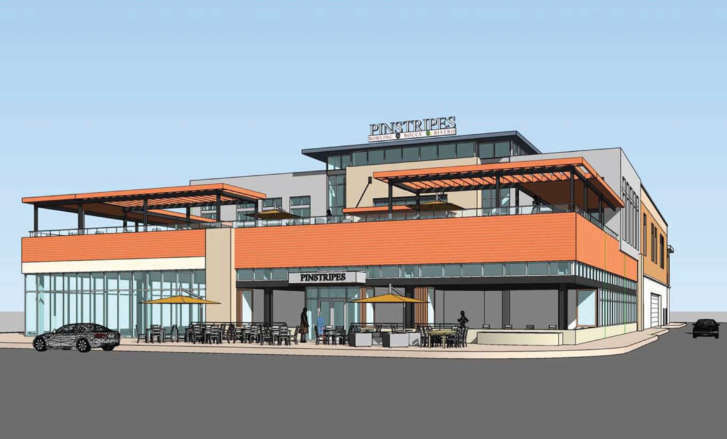 The Pike & Rose Pinstripes is a two-story, 37,000-square-foot location with 14 bowling lanes, 10 indoor/outdoor bocce courts and an Italian/American menu from the kitchen. It will have a large craft beer selection. It also includes a big outdoor patio. Pinstripes Bethesda is the eighth location for the chain. There are four in its hometown of Chicago, and other locations in Edina, Minnesota and Overland Park, Kansas. Others will open this year and next in Fort Worth, Houston and Frisco, Texas, Orange Village, Ohio, and San Mateo, California. “Pike & Rose is quickly becoming the premier destination for entertainment, dining and shopping in Bethesda-Rockville,” said Chris Weilminster, executive vice president of Federal Realty, developer of Pike & Rose. Pike & Rose has a dozen restaurants, and several large retailers, including Washington’s newest REI store, which opened in April. It is also getting a 22,000-square-foot, two-level L.L. Bean store this fall.